Chances are by this point in life you have a pretty good sense of yourself, both as an individual and as a cook. 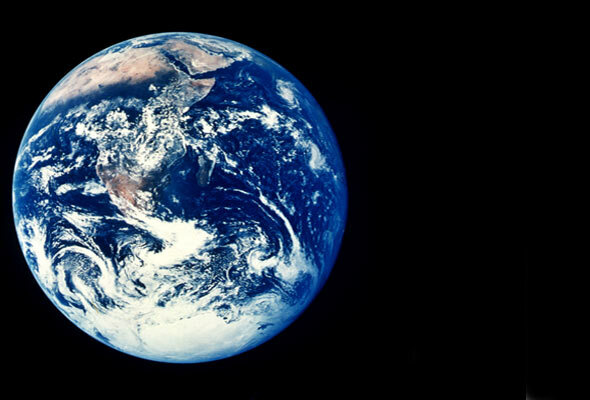 But you might not know exactly how this translates to you as an inhabitant of Earth. Are you an eco-conscious do-gooder? Grounded greenmarket-goer? Eco-friendly hipster? Yoga-minded vegan? 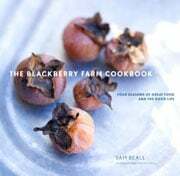 A spate of local-minded, sustainable, organic, seasonal, or otherwise eco-conscious cookbooks published in the past year or so were designed expressly to help you figure that out. Each sets out to inform and, by extension, assist your mindfulness and reduce your consumerism in some fashion. 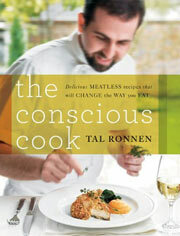 Perhaps you embrace this notion of conscious cuisine. Maybe you roll your eyes at it. The trick is finding some aspect of it that matches your mojo. That’s where we can help. We pored over every single page of these books so you wouldn’t have to, then catalogued our relatively unscientific but very opinionated findings below, each with a ranking of one to five, um, Birkenstocks. (We couldn’t help ourselves.) The answers are, we think, encouraging. As more than one of these books observes, pleasure is a much greater motivator than guilt. “You will never again stand in the market bewildered, wondering what to buy,” the author of this indispensable little reference guide says right up front. No small promise, yet Zissu delivers big. 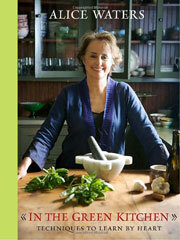 The author, bless her, includes a list of conscious chocolate makers (open the book straight to page 136). And although it’s not a cookbook, this little guide does include seven “recipes,” in a manner of speaking, including the simple, seasonal, satiating reminder that takes the shape of Roasted What’s-In-the-Garden. Neither, actually. “Conscious food is for everyone. It is not holier-than-anything, judgmental, or elitist,” says Zissu. Thankfully, neither is her writing style, which has an easy-going, just-like-one-of-us, only marginally sensationalistic approach that transcends cliques and social allegiances. She’s not dogmatic, just diligent in her research. Immense. It could easily become as thumbed-through and trusted a resource for conscious cooks as Mastering the Art of French Cooking was for home cooks. Could be. The book is a very bloggerly type of read, minus the blog. 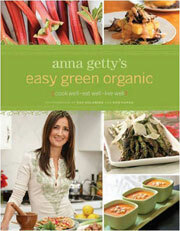 Author-actress-chef-yogi-writer-mother-activist Anna Getty’s pure intentions and sound advice come through loud and clear in a nonchalant, girlfriend-type of manner, with simple suggestions on how to inexpensively and easily go organic, drawn largely from an emphasis on reducing, reusing, and recycling. And that’s just the first 47 pages. The balance of the book contains dozens of seasonal recipes and those almost annoyingly charming pictures of Getty’s muses, whether the greenmarket, a schmear of miso, a Buddha statue, or family and friends at the table. We’re okay with housekeeping when done Getty’s way. She points out several things that ought to be obvious but are easy to overlook, such as saving glass jars with lids to use as food storage containers and relying on simple, everyday green cleaners (okay, we all knew about baking soda, but this is the first we’d heard of washing windows with club soda). Hippie—but in a contemporary Californian sort of way that condones chocolate just as readily as it embraces brown rice. High marks for making change seem as natural as can be. Witness Pea Tendril and Goat Cheese Frittata, Curried Deviled Eggs, and any of several decidedly decadent crisps, crumbles and pies. ~ Don’t eat breakfast cereals that change the color of the milk. ~ Do all of your eating at a table. ~ Never get your fuel from the same place your car does. Please. These little wisdoms apply to us all. Recipes are exceptionally well-written, anticipating all the questions home cooks have, and answering them before they arise. And the accompanying text is concise, well-curated, and calm as it debunks common myths and doles out helpful tips and insights. But remember, these are restaurant chefs. Terribly talented and enthusiastic ones. While there are ample quick fixes in the chapters for starters, small plates, salads, and desserts, there’s time and effort involved in many of the what’s-for-dinner type of entrées. Anyone not overly keen on seitan or tempeh or the like ought to focus almost exclusively on the aforementioned other chapters when seeking dinner inspiration. ~ Reasons for going vegan, articulated in just six short blurbs which manage to both resist scare tactics and include quotes from Albert Einstein and Paul McCartney. ~ The interview with The Quinoa Smuggler. Depends on how you define “hippie.” This cuisine sort of melds trendy hipster with adventurous hippie. Think quinoa maki with avocado; sweet onion beggar’s purses; a balsamic gastric; and the Oven-Roasted Banana Rum Cheesecake with Spiced Pecan Crust and Maple Rum Sauce. We don’t disagree with his right to woo meat-eaters over to the other side. Whether they miss meat is one thing. But we wonder whether they’ll regret all that time spent creating the more elaborate—albeit not complicated—preparations the book sets forth as dinner. That said, there is a doable number of little component recipes—Asian slaw, crisped udon noodle cakes—that you can bet will show up on our table in other remixes. 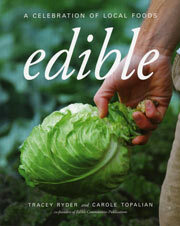 For those unfamiliar with the community-based Edible publications, the first local-minded edition was published in 2002 in Ojai, Calif. Less than two years later, it was lauded in the Saveur Top 100, which dubbed it “a concept we wish would crop up everywhere.” This book, compiled by the editors of that first Edible, is a collection of homages to local, place-based foods appearing in any of the 60—and counting—Edible publications. The book features two parts: Edible Stories in the form of essays about local folks, whether about antique apples or ocean vodka, and Edible Recipes, earmarked by season. There’s a lot of food for thought here, such as the Best Strawberry Shortcakes. Just don’t save it all for one sitting. 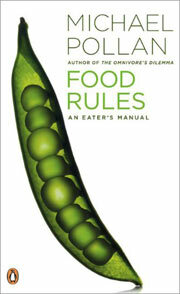 The handful of simple, commensensical, doable Tips for an Edible Kitchen found at the beginning of the recipes section. Honorary mention goes to the regional lists of People, Places, and Things. The introduction restates, over and over again, the value of local do-gooders. While we heartily appreciate these unsung heros, we get it sooner than the authors seem to think we will. The recipes have their moments, but feel disconnected from the text. Depends entirely on what you do with your newfound knowledge. 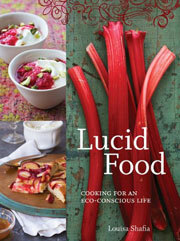 At first glance, this may seem like just another cookbook with an eco-friendly schtick slapped on the cover. Guess again. Like so many, author Aviva Goldfarb recently became savvy about the pleasures of local, seasonal food. 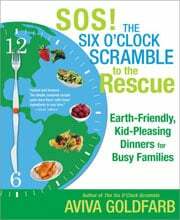 Except she went on to share that knowledge with thousands of others via TheScramble.com, her subscription newsletter of weekly mealplans, recipes, shopping lists, and tips geared toward the chaotic event that is the family weeknight dinner. Goldfarb has long believed that planning ahead makes for calmer, less expensive cooking, but she grew wise to the fact that it also makes for more planet-friendly cooking by minimizing food languishing in the vegetable bin and, natch, reducing takeout. There’s a handy chart for those who need reminding of what’s in season, as well as clever essays that address all manner of parental conundrums, such as “Easy composting for scrambling families” and “What to do when your child turns vegetarian.” Goldfarb doesn’t have all the answers, but she does have many of them. Will My Family Eat This? Let’s be clear about one thing: This is not couture cuisine, it’s make-it-through-the-week-with-kids-and-your-dignity-intact cooking. Recipes are devised by Goldfarb, a mom, with other moms in mind. An array of family-friendly recipes include Ginger-Soy Flank Fteak; a gussied-up rendition of Sloppy Joe’s; Creamy Baked Risotto with Secret Squash (it’s grated so as to be nearly invisible); Tilapia with Chinese Black Bean Sauce (with permission to substitute soy sauce for fermented black beans); and Celia’s Simply Irresistible Spaghetti, a slightly more ambitious take on plain pasta and butter. Some recipes call for garlic salt. Immense. If every family of four made dinner just one or two more nights a week, think of the savings not just in food packaging but money, well-being, and more. That’s something to brag about. Passion never fails to come through on the page. If ever there is evidence for that, it’s in Brooklyn-based caterer Louisa Shafia’s book, which hopes to help unknowing consumers discern the difference between free-range and grass-fed, biodynamic and biodiversity. 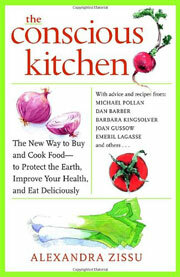 This earnest collection of recipes and advice is clearly born from a desire to help, and touches on topics as wide-ranging yet connected as urban gardening, preserving, composting, farmers marketing, and, natch, cooking in step with the seasons. There’s a whiff of ‘70s health-food store here. She’s not shy with the miso, seaweed, or tofu, although her recipes take a very straightforward, let-me-take-you-by-the-hand approach to the seasons. She certainly seems to know what she’s doing, evidenced by the Orecchiette with Morel Mushrooms and Ramps as well as Rhubarb and Pistachios over Thick Yogurt. Let’s not forget the Elderberry Cold Tincture. We’re already looking forward to winter. Reading the author’s idealistic and encouraging words can’t help but have an effect on anyone. In recent years, Blackberry Farm has become the darling of glossy magazines seeking to showcase seasonal, locally grown fare served simply yet stylishly. What could easily have become just another stunning coffeetable cookbook takes a slightly different, more responsible tact in this collection of seasonal recipes from the inn and restaurant, situated in the Smoky Mountains of Tennessee. An undertone of Southern seasonality and hospitality courses through the book, written and photographed by innkeeper Sam Beall, which chronicles both the famed meals from the inn as well as the simpler cooking that takes place behind the scenes for family meals. In the words and sentiments of former New York Times restaurant critic Molly O’Neill, which serve as introduction to the book: “Rather than writing a menu and then going shopping, the chef walks through a garden or greenmarket and cooks what is. This approach can deliver vibrant flavors and lively meals. Responsive cooking is not only a way to approach dinner. It is a way to approach life, grounded in what is, eyes wide open to what could be.” That pretty much says it. The introductions to chapters, menus, and individual recipes are interesting, sometimes taking the poetic interlude thing a tad too seriously. But then, maybe if we lived in such a bucolic place, so would we. Perhaps more notable is the Take-the-Book-and-Walk-Straight-Into-the-Kitchen Potential. Check out these Southern-influenced beauties: Sweet Tea-Brined Fried Chicken. Smoky Mountain Ramp Riosotto with Jack Daniel’s. Roasted Hen-of-the-Woods with Corn Pudding. Black-Eyed Pea Hummus. Spiced Cupcakes with Browned Butter Frosting. And several basic stocks, and marmalades, and pies, oh my. The whimsical scenarios for entertaining vary from the basic to the bewildering, including Barbecue: Pure and Simple; First Corn Supper; When Black Walnuts Fall; Sunday Supper Spring Chicken; and Yallarhammer Nights (you’ll have to read it to find out). And then there’s Ms. Waters. This book is essentially a hold-your-hand instruction manual of simple, straightforward kitchen techniques and tips, whether for boiling pasta, cooking rice, putting leftover bread to good use, and far more inspired suggestions such as pickling vegetables, and roasting chicken. In other words, the tenets of great cooking. The techniques are simply stated, sparely photographed, and infallibly tested so as to very quickly become part of the fabric of your being—and your everyday cooking. As long as you’re a home cook—or an aspiring home cook—it really doesn’t matter. Ms. Waters teaches basic skills that you can interpret however you please. Strong. And its dinner-saving potential? Off the charts. Take, for instance, David Chang’s Salt and Sugar Pickles, ready in just minutes. For more on Ms. Waters’ In the Green Kitchen, read our interview with her from earlier this week at Mother Earth’s Interpreter. Clearly, there are plenty more books out there championing ways eaters of all sorts can express their concern and compassion for the environment. Omission is not criticism. If you feel strongly about a book you don’t see mentioned here, let me know below. I’ll take ’em on, and we’ll be happy to consider it. Also, please, share your time-, money-, or earth-saving tips and revelations, too.